One day I was walking with Mr. Angelo, 69 years old, a former Renamo soldier, demobilized in 1994, who is now a farmer and a hunter towards his rice farm in Nvava, which is located in the lands of former colonial tea plantations called Cha Tacuane in Nvava, Lugela district, Zambezia Province, Northern Mozambique. As we walk he tells me that this tea you see here (pointing at a tea plant) was planted in the colonial period; I used to work in this company. When I look around I can see that the land was once used for monocrops, but currently colonial tea plants as wells the local plants co-exist, constituting the present landscapes as both places of memory and engendering new knowledges. The picture I began to paint is one in which the debris of colonial, socialist, civil war, and present neoliberal endeavors are the building blocks from which the foundations of a deep present and visions of the future are built. This realization prompted me to consider “radical bricolage” as a means of understanding these intersections of conservation, development and community life, taking into account the amalgamation of present, past, and visions of the future in Mozambique. The concept draws together Claude Levi-Strauss’s (1966) thinking about the “bricoleur” and Achille Mbembe’s notion of “radical uncertainty” (2011, 2017), to which I return below. 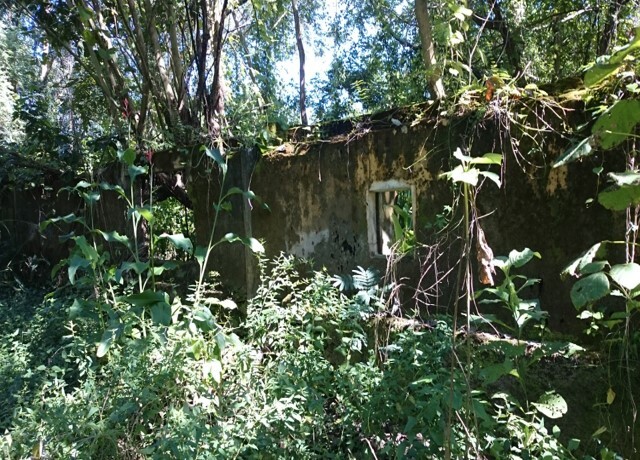 Building of a former colonial tea plantation company called Madal, destroyed during civil war. Photo by author. In 2005, Dr. Julian Bayliss from the Kew Gardens in London encountered Mount Mabu in Lugela District, Zambézia Province, Northern Mozambique using Google Earth. Then he made trips in which he confirmed that indeed the mountain was “unexplored” and “untouched” (Kew Gardens 2009). In 2008, the first of several major expeditions was undertaken, this time headed by Dr. Jonathan Timberlake, to examine the floral and faunal diversity of the area. This expedition was funded by the Darwin Initiative and the team included 28 scientists and support staff from UK, Mozambique, Malawi, Tanzania, Belgium and Switzerland, 70 local porters (Jowit 2008). One of the results of this and other subsequent expeditions was the discovery of new species of butterflies, snakes, flowers and chameleon, which then led to a media frenzy on a “discovered lost Eden on Earth” untouched by Man, a world that came to be called “butterfly forest” or “Google Forest” (Barbee 2017). This discovery and its media coverage prompted one internet explorer, or ‘internaut,’ to state, “I love this. Still discovering stuff on Earth, but apparently, we’re off to colonize Mars” on the comment section of Jeffrey Barbee’s article (emphasis mine). When I started my PhD studies in Social Anthropology at the University of Cape Town I was captivated by this story for two reasons: first, because it was an account of Western scientists discovering a mountain through Google that was long known by locals, and second, because it suggested possibilities for Mabu to represent a new kind of community conservation area. As a young black African aspiring scholar, I was drawn to the first stance, feeling compelled to denounce and resist this narrative. However, I later realized that while that critique was very important, focusing a whole PhD thesis on just denouncing would be missing out an opportunity to understand how community life in the areas surrounding Mabu might shape or be shaped by this conservation program—that is, how one understands oneself and the conditions one lives with. Furthermore, the work of denunciation would still be about the Westerners and would fail to account for what decolonial and Africanist scholars have called the “missing or silenced voices”. Mount Mabu. Photo taken by author. The Cameroonian Philosopher Achille Mbembe (2011, 2017) develops a concept of “radical uncertainty” to think about the conditions of “the human” in formerly colonized places, which I find helpful to account for the challenges posed by conservation narratives in Mozambique. He states that, “We no longer have ready-made answers to fundamental questions such as: Who am I? Who is my neighbour? What should we do with our (former) enemies? […] What is the relationship between the quality of persons on the one hand and material wealth, poverty, hunger and disease on the other? Is there anything that can be so priceless as to be immune from sacrifice?” (2011). And, with the current Earth regime we found ourselves in, marked by catastrophic environmental destruction, this instability leads to questions like, “What is nature?” And, “How might we to relate to it?” In this regard, according to Mbembe (2017: 123), “[radical uncertainty] makes any attempt to assign fixed identities impossible”. However, my field subjects showed that life was not suspended in the face of those instabilities, instead, they devised strategies to make everyday life and visions of a better future possible. They farmed with unpredictable climate, they worked with scientists, activists and state bureaucrats, they hunted, went to church, went for Sunday market fairs, prayed for their ancestors, etc. In their always shifting environmental context, radical uncertainty was a condition of everyday life. The people living near Mabu are what I call, “radical bricoleurs”. The concept of “bricoleur” is borrowed from the French Anthropologist and ethnologist Levi-Strauss’s (1966) work The Savage Mind in which he contrasts the work of a scientist and a magician. A magician, Levi-Strauss says, is a “bricoleur” who works with tools at hand for any event that might occur and he is limited by this repertoire of tools; bricoleurs speak to tools and usually end not moving beyond their current state of civilization, whereas the engineer or scientist works with creativity and speaks to nature to find answers to move beyond their current state (Levi-Strauss 1966: 25-30). However, even in Levi-Strauss this distinction comes with a tension: a bricoleur can also come to an innovative solution—and there are times when scientists also work as bricoleurs. It is in these conditions that conservationism, academia, NGO and state bureaucracy operate in Mozambique. These are the conditions in which the partial connections among communities, scientists, NGOs and state bureaucrats become or unbecome. In my work I try to extend the Levi-Straussian idea of tools used by bricoleurs to include both material and immaterial artifacts with which different actants make their daily life possible. In effect, radical bricoleurs do speak to a different “nature”: one that is not disentangled from human subjects or the “supernatural”. The other day I was talking to a representative of Justica Ambiental – Friends of Earth Mozambique, an environmental NGO, who was so frustrated with communities. In her own words: “When we go to the communities and tell them that they must resist things like Pro-Savana [a South-to-South large, agricultural scheme to be implemented in Mozambique by Brazil, Japan and Mozambique] they all agree to work with us but as soon as we leave we feel that they don’t really commit to that. There is an inertia. They even collaborate with the same companies we are fighting against. Maybe they are accommodated to poverty”. These are very strong and revealing words. Accommodation is an easy answer. Maybe this can be understood as an effect of “radical bricolage”. Conservation meets life in conditions of poverty. While it might take different shapes in different communities in Mozambique, it surely might say something about why communities choose to ally themselves with NGOs, bureaucrats, corporations, elites or not. Here lies the potential to explore the tension between reproduction and potential for generation, in these specific messy entanglements. Shifting the focus to communities, they felt that the NGOs were inert. NGOs were not doing as much as these local people were expecting, I was told by everyday people in Mabu. Communities needed help with basic needs in health, food, clothing, work, business and as they also would also stress ideas, because people grow with ideas. The NGO would say to me, “Communities don’t understand we don’t have much money and we depend on funding. 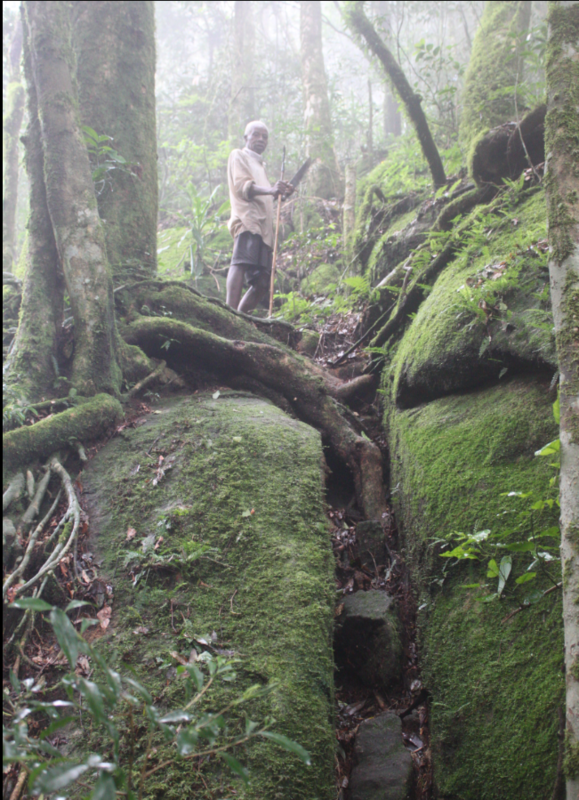 Our work is not development but help communities protect their mountain. We are not sure if the permission to turn Mount Mabu into a community conservation area will be issued by the government.” The efforts of NGO workers to promote conservation areas and the communities’ efforts to extract basic assistance from them despite mutual misunderstanding constituted a kind of “radical bricolage,” both fashioning something workable out of a nearly impossible situation. Hunter standing at the ‘neck’ of Mount Mabu. Photo by author. Time and time again I saw community members working with stuff (tangible and intangible) they had at hand to deal with their predicaments. I saw the same with NGOs and scientists. This reminded me of what young urban people in Mozambique often say when you ask them how they are doing. Most of the times they would say estou a tchovar, or estou a puxar which literally means “I am pushing”, or “I am getting by” which has been picked up by urban scholars to show the agency of urban young people to deal with various limitations imposed upon them. This is a form of bricolage done in contexts of what Achille Mbembe calls “radical uncertainty”. “Radical bricoleurs” blur lines between legality and illegality, formality and informality, nature and culture in complex ways. The conversations I had with the researchers from the Institute of Agricultural Research in Mozambique suggest that scientists from this scientific institution were also kind of porters, guides or data collectors, as the Beninese philosopher Paulin Hountondji (2009: 8) puts it: they do not frame issues but only collect data for issues framed by the Western scientists hence inherently extraverted. The data collected were then sent to South Africa or UK for analysis since Mozambique has no technical expertise and laboratories for such purposes. Therefore, Mozambican scientists are also ‘radical bricoleurs’. They must work with underfunding, and research agendas imposed under the name of collaboration. The lack of qualified staff, and political interference were also some of the challenges they pointed out as limiting factors for the development of their capabilities. The collaborations between scientists from the North – Kew Botanical Gardens – and the Mozambican scientists are carried out in those specific conditions with all legacies and present complex entanglements and visions of the future that they entail – a science happening in the context of making ends meet and sometimes passion. Nobody—not even the state bureaucrats and NGOs who are supposed to be leading the initiative—know for certain whether Mabu is going to be turned into a community conservation area or not. However, this possibility depends on these shaky alignments between scientists in the UK and Mozambique, conservation workers, community members, and others, some of which are unintentional and products of misunderstanding. Institutions like World Bank, EU, Conservation Funding bodies, Donors, Philanthropists, national and local political and economic elites have a significant impact on how things will turn out since they frame the rules of the game in which the “radical bricoleurs” must play. This brings me back to the main goal of my PhD, which is to understand local modes of living in the context of “radical bricolage.” There, extractivist and neoliberal projects continue to promise jobs, community development, better life and other riches to the people of Mount Mabu, in turn re-signifying life in rural communities and further inscribing the Western divide between nature and culture. Ironically, this inscription is done through the commoditization of nature via conservation. This is the “deep present” that communities must live with. “Radical bricolage” is about the sense of the “deep present” where all there is, is what is at hand, be this disenfranchised communities, nonhumans agents, colonial legacies, dependent NGOs, bureaucrats and scientists and their neocolonising Western counterparts. It is in this complex meshwork that certain futures take shape or not, that certain realities are made visible or not. As the Kenyan writer Ngugi Wa Thiong’o (2017) said in a talk in Cape Town in 2017, Africans must own their stories. As I showed above, the globalizing storyline on Mount Mabu is that white, Western scientists discovered Mount Mabu—a pristine, untouched and unknown biodiversity hotspot—using Google Earth. In this rendering, communities’ stories and modes of living have been omitted. Hence, as a “radical bricoleur” myself, I seek to bring their stories to surface. In their rendering, Mount Mabu is the older brother, the nearby River Múgue is the middle sister, and Mount Muriba is the younger sister. Each are parts of a kinship network that links communities to these more-than-land-formations, making life possible through an ethics of ori’a – respect. Clayson (2008) uses this concept to talk about the mixing of mathematics and art for pedagogical purposes. Julian Bayliss, “The Lost Forest of Mount Mabu”: https://www.youtube.com/watch?v=ZTMyDtHZXIc. Accessed February 20, 2016. For more details see Mbembe (2011, 2017). Clayson, James Edward. 2008. “Radical Bricolage: Building Coherence in the Liberal Arts Using Art Modelling and Language.” International Journal of Education Through Art 4(2): 141–61. Barbee, Jeffrey. 2017. “‘Who Knows What We’Ll Find next?’ Journey to the Heart of Mozambique’s Hidden Forest.” The Observer, March 25, 2017, sec. World news. https://www.theguardian.com/world/2017/mar/25/journey-mozambique-mabu-forest-julian-bayliss-google-earth. Hountoundji, Paulin. 2009. “Knowledge of Africa and Knowledge by Africans: Two Perspectives on African studies. RCCS Annual Review. http://www.ces.uc.pt/publicacoes/annualreview/media/2009%20issue%20n.%201/AR1_6.PHountondji_RCCS80.pdf. Accessed April 4, 2018. Jowit, Juliette. 2008. “British Team Discovers Lost Eden amid Forgotten Forest in Mozambique.” The Observer, December 21, 2008, sec. Environment. https://www.theguardian.com/environment/2008/dec/21/mount-mabu-mozambique-jonathan-timberlake. Accessed October 18, 2018. Kew Gardens. 2009. 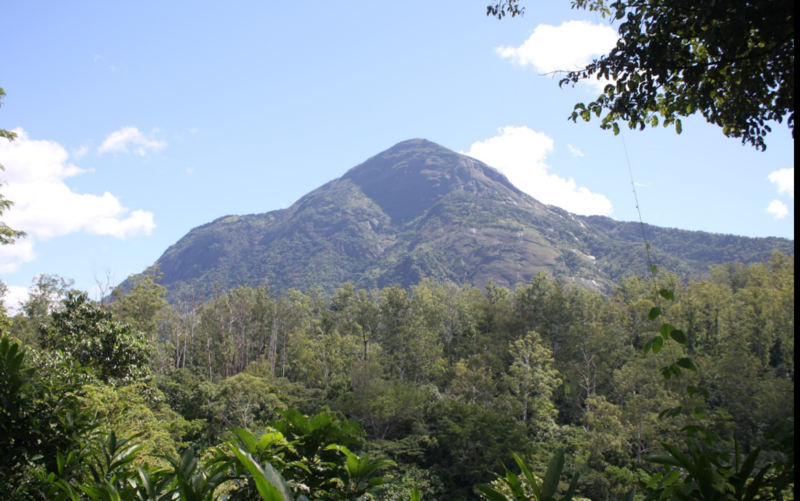 “Google Earth Helps Kew Put ‘Lost Forest’ of Mount Mabu on the Conservation Map – Kew: Science News.” Press Release. London: Kew Gardens. http://static1.kew.org/science//news/mount-mabu-mozambique.html. Levi-Strauss, Claude. 1966. The Savage Mind. Chicago, IL: The University of Chicago Press. Mbembe, Achille. 2011. “Democracy as a Community of Life.” The Johannesburg Salon, 4. http://jwtc.org.za/volume_4/achille_mbembe.htm. Accessed May 10, 2018. Mbembe, Achille. 2017. Critique of Black Reason. Translated by Laurent Dubois. Durham, NC: Duke University Press. Wa-Thiong’o, Ngugi. 2017. Untitled lecture. Great Texts / Big Questions Lecture Series. Institute for Creative Arts, University of Cape Town. March 3, 2017. Cape Town, South Africa. Anselmo Matusse holds a bachelor’s degree in English Language Teaching and Anthropology from Eduardo Mondlane University, Mozambique, as well as a master’s degree in Environmental Science from Linköping University, Sweden. With research interests in forest management, indigenous knowledges, STS, water-food-energy nexus and decoloniality, Matusse maintains a blog on science and society, and is currently a PhD Candidate in Social Anthropology within the Environmental Humanities – South collective at the University of Cape Town. He is also a researcher at Kaleidoscopio – Research in Culture and Public Policies. Matusse loves rural life as well as forests and oceans.